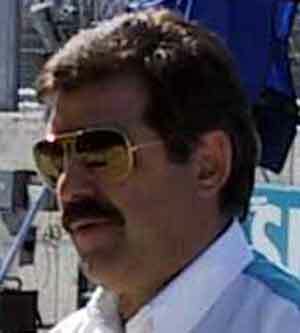 A mechanical engineering graduate of Argentina's University of the South, Sergio began racing with the Chrysler Formula 2 team in Argentina in the late 1970s. He moved to England in 1980 and was appointed chief designer of the Pro Racing Services company, which was run by Vic and Steve Hollman in St Albans, Hertfordshire. Rinland designed a Formula Ford 1600 car for the 1981 season and this achieved limited success in a variety of the lesser European Championship. In 1983 Rinland was hired by RAM Automotive, which had decided to build its own F1 cars after falling out with March. David Kelly led the design team with Rinland as one of his assistants. The RAM-Harts of 1984 and 1985 were never very successful but the RAM 03 of 1985 was a tidy car and as a result Rinland moved to Williams to join Patrick Head's team for the design of the 1986 Williams-Honda. At the end of 1986 Rinland was hired by Brabham after the departure of Gordon Murray and he joined John Baldwin and David North to design the Brabham-BMW BT56. This had an innate disadvantage as they were forced to use the laydown BMW turbo engines but both Riccardo Patrese and Andrea de Cesaris were able to finish on the podium in the course of 1987. At the end of that year Bernie Ecclestone decided to withdraw the team from F1 for a season and so Rinland moved to Dallara to design a car for Scuderia Italia. The BMS 188 was a straightforward car and was driven with moderate success by Alex Caffi. Rinland then returned to Brabham, which had been taken over by Joachim Luhti. The Judd-engined BT58 was driven by Martin Brundle and Stefano Modena. Rinland stayed at Brabham until it closed down in 1992 but the lack of money meant that the cars were not very competitive. After Brabham's closure Rinland established his own design company called Astauto. This employed many of the Brabham staff and produced a car for Gabriele Rumi's Fondmetal F1 team. Unfortunately the new car appeared only a few times before the team was closed down. Rinland then went to the United States and worked with Dan Gurney's All American Racers on the design of the Eagle-Toyota Indycar before returning to Europe to become Technical Director of the Forti Corse Grand Prix team at the start of 1995. This lasted for just a couple of months before he moved on to work for Keke Rosberg's Opel team in the German Touring Car Championship. At start of 1996 he joined Benetton as the senior composite design engineer and remained at Enstone until the end of 1999 when he was named chief designer at Sauber. That role lasted just a year and he moved to Arrows where he stayed until the team closed down in 2002. Since then he has worked as a consultant with his companies Astauto and TotalSim. He has also gained an MBA.